One big plus with houseplants is they can be enjoyed all year long. However, a few simple tips can let you enjoy them more… even something as simple as raising the plant can create new looks and plant possibilities. 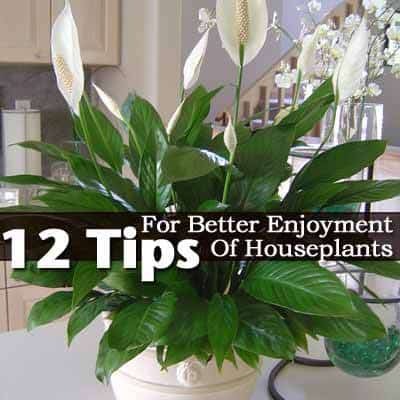 Below you’ll find 12 houseplant tips for more enjoyment. We’ve talked over the years about house plant care. Besides the benefits they provide in removing toxins from the air, studies show they can help reduce stress as well. I think of houseplants as great accessories to indoor microclimate – they can be moved, replaced, mixed and staged with other plants and some cool decorative containers. Here are 13 tips you can follow in displaying houseplants successfully. Take an easy to care for houseplant, elevate it, to create new looks. Elevating some of your plants can also help them receive more light and create a “bigger” plant at a lower cost. Raising a plant can allow use of the plant in areas it normally would not fit because of width or lighting. Singling out a plant can make a visual statement or bring drama to a living room. For example, elevating this snake plant in a large pot makes it stand out. When landscaping many plantings are in odd numbers, unless they are “formal” plantings. The same goes for plants indoors, group or display in odd numbers, one, three, five or seven. Plus, for whatever reason, the odd number creates a more interesting look. Far too often many houseplants find their death from over care and over-watering. Most plants like to dry out a little between waterings. You should learn the needs of your plants and when they require water. I have some plants indoors that get watered every week, and others which can go 2-4 weeks between waterings. A well-drained soil works best for most houseplants. Make sure there are enough drainage holes in the planters with potting soil or potting mix to prevent over-watering. 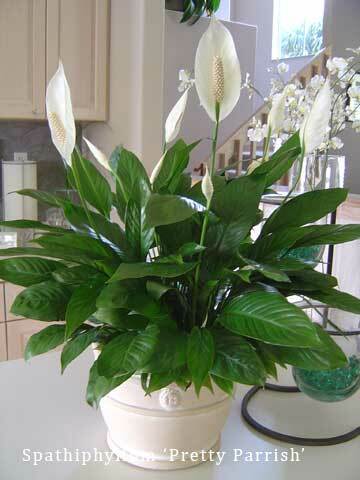 Some varieties require more moisture – like the peace lily. Watering schedules can also change depending on the mirco-climate in your home. For indoor use I like to use subirrigation when possible. Even when asked on how to care for a spider plant I’ll recommend sub-irrigation. Move houseplants in need of pruning, looking a little weary or your “back up plant” to a sunny window or porch, back room or a basement equipped with fluorescent grow lights. Make sure to show off their dark green leaves, sturdy stems and magnificent flowers, if there are any. Then rotate the best looking plants in and out every 3-4 weeks. It is important to match the plant to the lighting available or provide some extra lighting as in the base of a basement or room equipped with grow lights. Some indoor plants need adequate bright light but they may be damaged when placed under direct sunlight. First start with the right plant and right light – then add extra if required… you’ll have more success! Keep in mind that there are some house plants that require indirect light. Check out these low, medium and high light house plant recommendations. Think for a moment ask ask yourself – How would you label your room for plant lighting? Also check out Lighting Plants for Decorative Use. Add depth by mixing up different textures, color of foliage and patterns, then tie them together by using the same color and size pot to display them with. Just as in #5 the right plant for the right light – the right plant for the right space is also important. For example, a 14″ Dracaena may need an area of 4 foot by 4 foot to give it the required space. Consider buying smaller plants, incorporate item # 1 and “grow the plant” into the space. You may also want to choose popular houseplants that are usually easy to grow such as snake plant, umbrella plant, aloe vera, African violets, kentia palm, and succulent plants. Size is not the only issue, room temperature can play a part as well in the plant selection process. Your skin dries out when humidity is too low, indoor plants and tropical plants are not fond of low humidity either. Consider clustering air plants together to achieve a high humidity – watch out for reduced lighting! Humidifiers – freestanding or built in can help reduce dry indoor air conditions. Of course, there is the old plant stand by – setting plants of trays filled with pebbles or gravel and water. A device called humidity tray will help flowers last longer and keep your houseplants happier. Line plants at different height to make the eyes move or place smaller plants to the base of taller ones for additional interest. Like antiques, stay with a Victorian favorite – Boston ferns. Southwestern style – think types of Yucca or cactus and terra cotta pots. Bonsai does well with ceramic pots. Dracaenas and bamboos mingle well with Oriental furniture. Dracaenas look great in a glazed or china pot. Take the time to match the style with the potted plants. During the winter houseplants can over heat in the warm dry air. Most indoor plants will do well in temperatures from 60 – 75 degrees in the day and 60 – 65 degrees at night. Too may houseplants can give a cluttered look. Personally, I like single specimens to show off nature!